UPDATED: May 25, 2018 This is Alan Arnette’s Everest 2018 coverage and annual coverage and based on my own Everest and K2 summits and climb experiences, research, sources, and public information. I try to provide insight and interpretation of the activities ranging from routes to weather to the challenge of climbing Everest. A sincere and deep thank you to everyone who joins the Alzheimer’s Prevention Registry or makes a donation to one of the Alzheimer’s nonprofits. 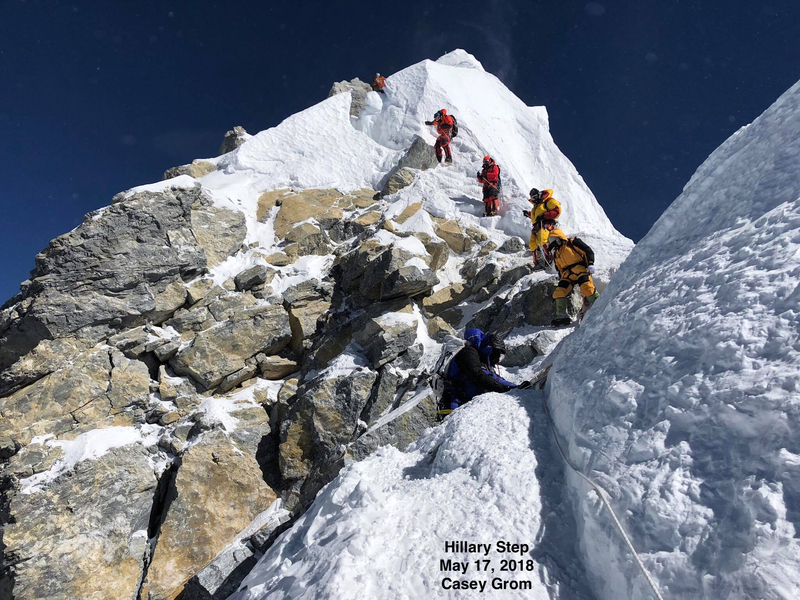 Hillary Step 2018 by Casey Grom, Hillary Step has changed and not just covered with snow. With an unprecedented weather window, the Everest season is winding down I estimate a total of over 800 summits smashing the previous record set in 2013 of 667 from both sides by members and support climbers. The Nepal Ministry of Tourism reported on 16 August 2018 that a total of 563 people summited during the spring of 2018 made up of 302 High Altitude Workers (aka Sherpas) and 261 foreigners (aka members) using the standard Southeast Ridge route in Nepal. I estimate 239 summits on the Northeast Ridge in Tibet. Nepal issued 347 Everest climbing permits to foreigners, including 20 Nepalis, making the overall summit rate of 75% for members on the South side. There were 52 female summits on the Nepal side in 2018. The Nepal Government collected USD$5,172,408 in permit fees. They noted that the summiteers included 51 Indians, 49 Americans and 47 Chinese. Hillary Step has changed and not just covered with snow. Franz P. Rassel became the first Paraguayan to summit Everest. Pasang Norbu Sherpa (41) died at 28,051’/8550m working for 7 Summits Club summit push from Tibet Details. Matt Moniz and Willie Benegas had to slow down and stop because they were climbing too fast otherwise they wold miss the sunrise!!!! Summit Oxygen problems reported by Nepal side teams in addition to North teams. Carlos Soria Fontán has reportedly abandoned Dhaulagiri citing high winds. 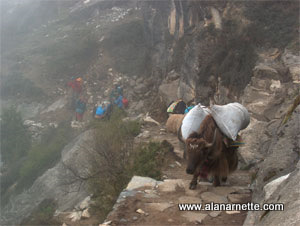 Rupert Jones-Warner summited from Nepal now moves to Tibet. Lhakpa Sherpa 9th summit from North Side. New World Record for women! Breaking her own record. Steve Plain set the time record for climbing the 7 Summits at 117 days. Rope fixing team made the summit from the Nepal side at 3:30 pm, on 13 May 2018. Two Sherpas were hurt when a serac collapsed towards the top of the Khumbu Icefall. IMG Hybrid (5) e ? Summit Climb (5/1) e ?/? Fixed Line Progress X X X X X+ 10? LEGEND T/D=Trek/Driving to BC, K=Kathmandu, La=Lhasa, Lo=Lobuche, e=climb ended, x=last reported location, x+ =on summit bid, -x =descending h=high sleep point, t=touched not slept. Summit number=member/Sherpa. Locations estimated from public websites. Please refer to each expedition’s site for current information. Contact me to add/remove your team from my coverage. did Tenji and Jon make the traverse after all? “Only” Everest, weather moved in. Also no livestream, their sat equipment failed.